Plus their Greatest Hits LP! 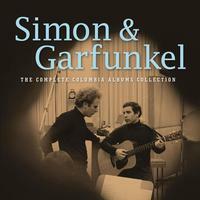 The most comprehensive Simon & Garfunkel library anthology ever assembled, The Complete Albums Collection includes the duo's five studio masterpieces (first released between 1964 and 1970), newly remastered from first generation analog sources, and first-time remasters of The Graduate (the groundbreaking motion picture soundtrack album released in 1968) and the long out-of-print The Concert in Central Park (recorded in 1981). LP 1: Wednesday Morning, 3 A.M.